Ed100 walks parents through a range of California school issues and policies in 10 chapters divided into manageable subsections. A joke around Sacramento is that it takes a Ph.D. in Proposition 98 to understand how California schools are funded and governed. The truth is that a good short course is probably all that’s needed for the basics of California’s complex education policies. And now there is one – Ed100.org. Created by Jeff Camp, a former Microsoft Corp. manager and a longtime champion of public involvement in schools, Ed100.org is a free, 10-chapter online course that people can explore and complete at their own pace. The California PTA and the Full Circle Fund in San Francisco partnered with him. The goal, said Camp, is to cut through education jargon and help prepare parent leaders – and parents who may not yet know that they’ll be called on to be leaders – with basic information they need “to be influential and smart.” At that stage, they’ll be able to “confidently interact with anyone who makes decisions on education,” he said in an interview. Camp, who is a parent himself, went through the process a decade ago when he wanted to know more about education policies. He said he constantly felt as if he were jumping into the middle of a book – without context and background, let alone knowledge of the acronyms that educators and policy makers tend to use – to understand the nature of the issues and conflicts. Camp served on Gov. Arnold Schwarzenegger’s Committee on Education Excellence, which recommended significant changes in governance and finance in 2008. He also chairs the Education Circle of the Full Circle Fund, which encourages its members to take on a project to improve schools in the Bay Area. 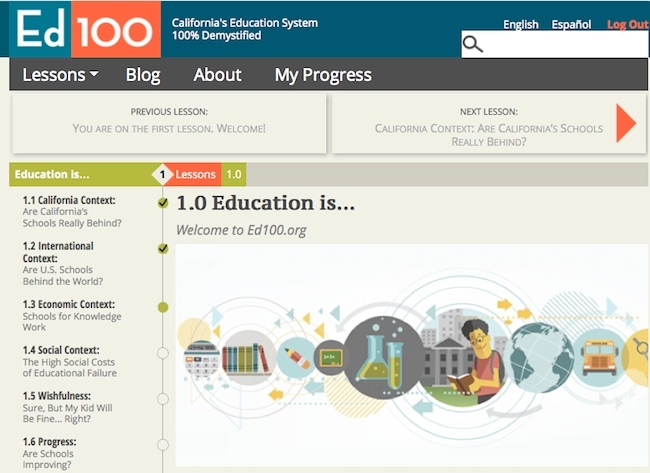 Camp started the Ed100 website two years ago and now, with the help of Mary Perry, a former deputy director of EdSource and expert on California school governance, and Carol Kocivar, an attorney and past president of the state PTA, has updated and relaunched it as a formal course. The timing, with the shift of control over spending and policy decisions from Sacramento to local districts, through the process of creating a Local Control and Accountability Plan, or LCAP, is fortuitous, Camp said. The PTA has created a checklist, tied to the LCAP, that parents can use to do a detailed needs assessment of their school and make recommendations for improvements. Chapters and subchapters cover a range of issues related to students (who they are in California and what their needs are); teachers (preparation, pay, evaluation, collaboration); finances and resources (from Prop. 13 to the Local Control Funding Formula); governance (federal, state and local powers, the role of unions and foundations); and measurements of success (academic standards and standardized tests, college and career readiness). An example is subchapter 2.2, on poverty and race. In 600 words it summarizes studies that found correlations between poverty, race and academic results. It includes a chart of international academic comparisons and a graph plotting the relationship between poverty and Academic Performance Index scores in California, with links to various research. The section presents an objective look at a complex subject. Reader comments are encouraged; in this case, UC Berkeley author and sociologist Bruce Fuller was the first to submit his. Camp said it’s difficult to estimate how long it would take a person to complete the course. A parent worried about discipline in her school may focus on that section and fly past the subchapter on teacher pensions. Another reader may spend hours following the links on pension reform. He’d like to see parents approach Ed100 as a book club, and go over the course together. The PTA agrees and referred to Shereen Walter, a PTA vice president for advocacy in Orange County, who said she plans to organize several Ed100 study groups in her district when school resumes in the fall. By fall, Ed100 will be part of the course reading for an online Stanford University course, “Changing Education,” that Professor Susanna Loeb, director of the Center for Education Policy Analysis, will teach. Ed100 also plans to release a version in Spanish and video tutorials. Financial supporters for Ed100 include Full Circle Fund, the Stuart Foundation,* the Dirk and Charlene Kabcenell Foundation* and the Noyce Foundation. * EdSource receives financial support from these foundations. John Fensterwald, who covers education policy, provided some feedback for earlier versions of Ed100. Contact him and follow him on Twitter @jfenster. Sign up here for a no-cost online subscription to EdSource Today for reports from the largest education reporting team in California. Great to see ed100 reinvigorating itself! What I could really use is some advice on addressing the wishful thinking (1.5) and general apathy, lack of interest, lack of hope, or whatever else might fit in this general category. Paul, I hear you. In throwing our effort behind Ed100 we are making a bet. In every school community there are a few leaders or potential leaders, especially among the parents. The system is not set up to develop these leaders intentionally. What if we change that? What if we make it easier and faster for parent leaders to learn the issues, and understand their own context more deeply? Might they grasp the new power that they are being offered, at least rhetorically? Can they overcome the bias for inaction? To me, some of the most crucial graphs in ed100 (at a macro level) are in lessons 1.2 and 3.1, and the most important story is in 1.7. Slow, gradual changes are easy to miss but deserve response. What kind of future do we want for our kids? Women and especially mothers in the 20th century made effective demands on behalf of children. Can that spirit be reawakened in the 21st? This sounds awesome! I wish my district would work towards rolling out the next layer. It’s really hard to understand where the money is being spent and why. The passage of LCFF fundamentally changes the governance structure in this state. The new system strongly relies on parents and community members to not only work with their districts, but also provide a level of oversight to ensure that the focus remains on students and not adults. For parents and community members to step-up their level of engagement in the education decision making process, they need to be well informed about how our education system works. This revised web-site provides parents and community members with the details that they will need to know to actively engage in the development of local implementation plans for LCFF. Thanks to Jeff and Mary for all of your work on this. Thank you, Jeff, for spearheading this effort and joining forces with the PTA. Knowledge is power in public education…and let’s hope that translates into informed voters! CA education policy is complicated. A great resource to help understand it. Ed100 is the premier medium for parents and other critical individuals to understand the complex reality of California’s education systems. With this tool, parents can understand what us Ed policy wonks in Sacramento and around the state are talking about!